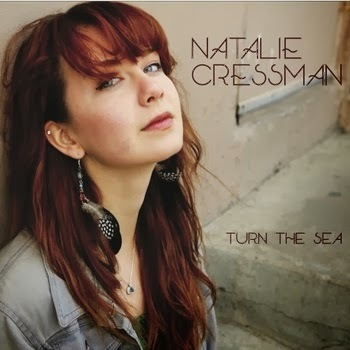 Natalie Cressman's Turn The Sea: Is this the course of Indie-Jazz? It is becoming an increasing cliché to talk about music being genre-crossing as it seems almost every week I come across music that defies categorization. After reading many interviews by some of the most accomplished practitioners of contemporary , improvisational based music, often lumped together in a category labeled “ jazz" ( link to my review here of Radhika Philip’s book of interviews titled Being Here), it becomes apparent that most musicians shun having their music pigeon-holed by labels at all. 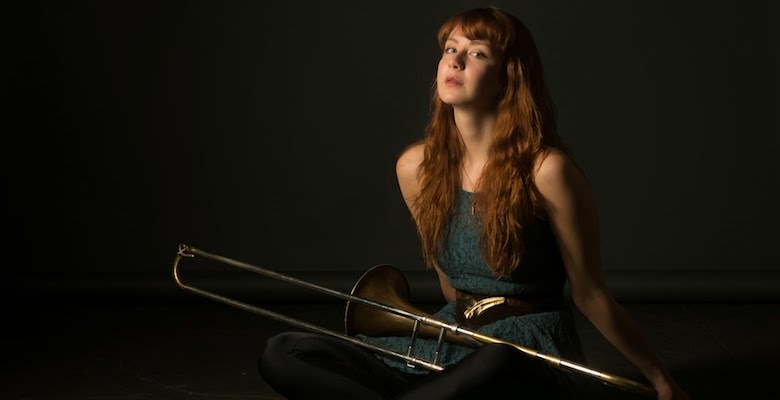 Along comes Turn The Sea, a new album from the twenty-two year old trombonist Natalie Cressman, who also happens to sing and compose, and you realize how labels become a waste of time. Ms. Cressman comes from a musical family- a jazz vocalist mother and a trombone playing father-so it was a natural progression for the young woman to explore her own musical career. Her father was a one-time member of the band Santana as well as a touring member of the jamb band Phish. Admittedly, Ms. Cressman had a distinct advantage when her father decided to quite touring with Phish and suggested his daughter to replace him in the brass section. She was just eighteen at the time. Getting a once in a lifetime opportunity is one thing but making it on tour as a professional musician and completing an education at Manhattan School of Music is a feat few could handle at such a young age. She certainly seems to have managed nicely. Turn the Sea incorporates many diverse elements including Ms. Cressman’s trombone, her compositional tendency toward storytelling and her beguiling voice. Ms. Cressman’s voice has an indie-folk, softly spoken sound- a modern version of Jacqui McShee comes to mind- and she harmonizes with herself nicely through overdubs, especially on Bon Iver’s “Blindsided,” one of only two tunes on the album that are not her own compositions. The music is expertly played by her band Jonathan Stein on acoustic and electric bass, Gabe Schnider on guitar, Samora Pinderhughes on keyboards, Ivan Rosenberg on trumpet, Steven Lugerner on flute, clarinet and bass clarinet , James Casey on tenor saxophone, Michael Mitchell on drums and of course Ms. Cressman on voice and trombone. The music is well conceived exploring multiple rhythmic patterns, adept arrangements and vocals that linger hauntingly in their purposeful unpretentious beauty. The result is a surprisingly fresh approach that incorporates some of the best elements of jazz and indie music and defies categorization. As a brass player herself, Ms. Cressman is well aware of the impact a good brass and reed section can lend to a song when incorporated into the mix effectively. To her credit she uses the various voices in her ensemble to great effect especially on the opening of the title tune “Turn the Sea.” The synchronous front line playing of reed and brass lend the song a jazz sensibility and cues the listener to be on the lookout for creative arrangements. "Fortune’s Fool” is propelled by an interesting rhythmic pattern developed nicely by Stein’s serpentine bass lines, Mitchell’s syncopated percussive drive and the ethereal keyboard work of Pinderhughes. This song utilizes echoed guitar chords and a dancing flute to give it a light atmospheric sound accentuated by the airy Celleste sounding Rhodes work by Pinderhughes and Cressman’s deft vocalizations. Cressman’s successful reworking of the Bon Iver song “Blindsided” is the most Indie sounding of the songs on the album. Cressman utilizes overdubs of her own mid-ranged voice juxtaposed against some tasty bass clarinet work by Steven Lugerner to great effect in the chorus. This opens to a poignantly played trombone solo that is surrounded by dancing reeds. Jonathan Stein’s acoustic bass anchors the song with a large firm tone throughout. “New Moon” is a mixture of modal groove, Ms. Cressman’s storytelling accentuated by flute and reed orchestration and West African inspired chants and rhythms. One might suspect the mixture could tend toward the schizophrenic, but Ms. Cressman manages to make the seemingly disparate elements work quite well together. At times on this song, when she harmonizes with her own voice, she sounds strongly reminiscent of the Polish singer Basia Trzetrzelewska, but the music is a prime example of a blurring of genres. On Hanne Hukkeberg’s “Do Not As I Do,” perhaps the most melodic of the songs on the cd, the cautionary lyrics are recited by Cressman who talks of past mistakes without judgment and no regrets. Her voice is light and confident as she sings the chorus with an innocent beauty. “Checkout Time,” uses multiple overdubs of Cressman’s voice to create an eerie repeating rhythmic pattern over which she sings the main lines accompanied only by Rhodes. A deeply echoed voice is electronically enhanced as she sings accompanied by Gabe Schnider’s sparse guitar. The song has a an electronically enhanced minstrel-like quality to it, but doesn’t seem to be fully realized. “Winter Chill” is Ms. Cressman’s most pop oriented of the songs on this album. The lyrical content of the song is predictably about a lost love and the orchestration is the least daring of her compositions, the chorus being the most memorable part. On “Stolen Away” Ms. Cressman returns to the rhythmic influence of West Africa. Mr. Schnider keeps the beat with his syncopated rhythm guitar as Ms. Cressman gives us a taste of her musical muscle on a rousing trombone solo. The band creates an irresistibly danceable groove that is only reinforced by Ms. Cressman’s repeated catchy vocal refrain of “Stolen Away.” This one could be prime for repeat radio play. The finale is an electronically produced version of the title tune “Turn The Sea,” a remix version produced by the band’s bassist Jonathan Stein. Ms Cressman’s trombone solo is drenched in electronic sounds and synthesized sounds have been incorporated throughout. The production sounds a bit too busy for me and I prefer the original version. Though a bit uneven Turn The Sea is for the most part an enjoyable offering and deserves a serious listen. It just goes to prove that improvisational music can successfully take off in any number of directions and it’s up to us to be open enough to consider the possibilities. 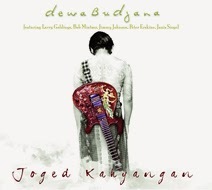 Dewa Budjana's "Joged Kahyangan" or "Dancing Heaven"
The route from pop music star to jazz master has been a long developing trend in the music of guitarist Dewa Budjana( pronounced Dew a Bu dzana) . As the lead guitarist and songwriter for the pop/rock group Gigi for the last twenty years, a wildly popular band in Indonesia, Budjana’s music has been heard by millions of adoring fans. But Budjana’s music is the distillation of many diverse influences outside of the world of rock and pop, including the fusion music of Mahavishnu and Soft Machine, and the Indonesian music rooted in his heritage and the Balinesian Hindu religion. On Joged Kahyangan (which translates into “Dancing Heaven”) Dewa is joined with a talented group of American, west coast based musicians including the saxophonist Bob Mintzer, the bassist Jimmy Johnson, the keyboard artist Larry Goldings and the drummer Peter Erskine. Together they who play eight compositions, all original music by Budjana. It was the guitarist’s initial email contact with drummer Erskine back in 2002 that led to a recording titled Samsara and a continued relationship. Erskine, the one time Weather Report drummer saw in Budjana a unique and creative sound that could be further developed and explored. At fifty years old Budjana’s music has matured, as evidenced by some of the sophisticated themes he has written for this cd. From the opening title “Foggy Cloud,” written while in the East Javanese Mountains, you get the sense that Budjana’s music is strongly tied to memorable melodies. The ostinato phrasing is used as a structure upon which he builds tension employing various tones and textures on his guitar. On this song Budjana’s sound ranges from the smoothly slurred, studio precise lines of a Larry Carlton, to the power driven lines of early Mahavishnu, to the expansive atmospherics’ of early Pat Metheny. The band superbly drives the rhythmic energy with taut precision and inventive soloing, especially by keyboardist Larry Goldings, whose is a fountainhead of taste and subtlety. The title song “Joged Kahyangan” is an uplifting aural dance using a fascinating mixture of eastern and western musical styles. A Balinesian minuet if you will. Bassist Jimmy Johnson’s spritely solo on electric bass is a miniature delight. Bob Mintzer on bass clarinet and Budjana on acoustic guitar trade elegant dance steps in magical time, as Goldings’ synthesizer work conjure a mystical backdrop. This one flows so smoothly that it requires multiple listening to appreciate all the nuances. “Dang Hyang Story”, inspired by Budjana’s Hindu faith, is the most purely fusion sounding composition using an exotic Middle Eastern sounding head that breaks into a more melodic core. The complex serpentine lines are done in precise unison by Mintzer on tenor, Budjana on searing electric guitar and Goldings on synthesizer. It features some rhythmically complex drum work by the impressive Peter Erskine who seems at ease with the eastern influence imbedded in Dewa's music. When he solos, Dewa’s guitar takes on a heavy fusion tone, a ripping sound that is reminiscent of early Alan Holdsworth. The composition is a powerful driven but yet strangely hopeful song, a marvelous mix of both energy and beauty. The ballad “As You Leave My Nest” is a bit too soppy for me. Vocalist Janis Siegel lends her considerable talents to this pop oriented ballad with some soaring vocals that have an ethereal texture. “Majik Blue” again uses a series of repeating, descending lines as the basis for the composition. Mintzer takes up soprano saxophone and Goldings trades his piano and keyboard for what sounds like a B3 organ for part of the song. Budjana sets his guitar into piercing mode and Johnson plays a brief but potent solo in a song that sounds like a tip of the hat to Weather Report. The complex repeating lines are expertly matched by the entire band in a show of precision and solidarity. “Erskoman,” a composition dedicated to the drummer Peter Erskine, is a groove based song that has all its participants in exquisite form. Budjana’s guitar is perhaps most musical here with a pleasant, single line tone that he occasionally juxtaposes at the breaks into powerful chording and octave work. Goldings is a delight on his B3 organ, the perfect instrument on this swinging groove. Erskine lets loose with a series of syncopated breaks that demonstrates his formidable rhythmic prowess. Budjana returns with his synthesized sounding guitar pulsing out inventive lines that defy categorization or predictability. The music was mostly recorded in one or two takes. As this track ends, the running microphone catches the band acknowledging what any listener can easily surmise, this was a good take. “Guru Mandala” is perhaps the funkiest of the songs on the cd, with Erskine’s driving back beat prominent. Budjana plays some expressive lines on what sounds like an acoustic guitar, but for the most part the song sticks to a simple repeating melodic line that fades into a eastern chant-like coda. “Bora’s Ballad” is an instrumental version of the previous song “As You Leave My Nest” with Erskine’s barely perceptible brush work and Golding’s hushed organ work. The song offers a peaceful conclusion to an otherwise stirring album. Budjana has a delicate side to his playing, a side that is both pretty and sensitive, but that can at times border on overtly sentimental as it does here. Dewa Budjana has impressive skills both as a player and as a composer. On Joged Kahyangan he manages to skillfully mix the music of his native Indonesia with pop, jazz, fusion and rock into an impressive amalgam that is unique to him and worth watching as it continues to develop.